Base station for 4 portable warmers. The warmer is a handheld device with Li-ion rechargable battery. It is equipped with heating element, Digital sensor, microcontroller, nonvolatile memory and LED indicators. When placed on base station, it gets conected electrically by its contacts. These contacts help base station and the mobile device communicates with each other and also charge the battery. The mobile nest when in mobile mode continuously monitors the temperature with a 14 bit accuracy, corrects it several times a second. This yields a rock steady temperature profile evenin varying surroundings. The mobile nest continues to log for the power consumption index and temperature abnormalities. These are downloaded to the base station when the nest is docked. With monitoring and reporting features, the user can be assured about the mobile nest working accurately at every step. A transparent window facilitates easy viewing of the follicular fluid. 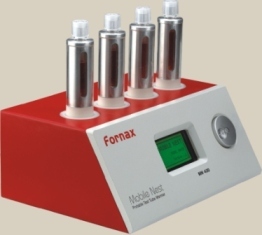 The Falcon Tubes (2001) pre heated by regular Test Tube Warmer loses its temperature in less than 15 seconds the moment it is out of the heating block and the tube reaches near to the room temperature, thus increasing the risk of thermal shock to the oocytes during aspiration. Mobile Nest is Portable Test Tube Warmer with it’s own Internal rechargeable Battery which gives immense mobility and at the same time maintains precise temperature. Digital programming by microprocessor control in increments of 0.1 °C. Measurement of temperature in tube holder via digital sensor. Over temperature protection system independent of microprocessor control. Range 2°C above ambient to 40°C, Control ± 0.2°C, Stability ± 0.1°C, uniformity ± 0.2°C, Indications and signals, Visual indications power on/off, Target temperature sustained /out of range, Battery charged /discharged/low.